I've been going over and getting a burger at Gallagher's, which is just west of 67th Avenue on Peoria Avenue, for like, forever. And it's one of those places that I hope will be there forever. 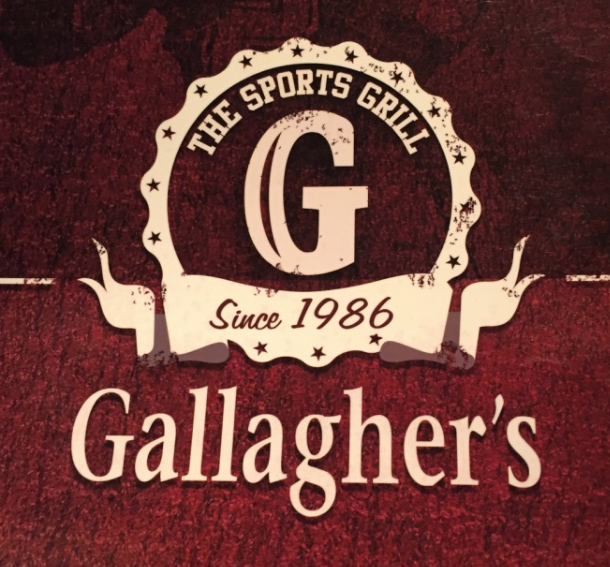 Since I'm interested in Phoenix history, I wish I could tell you more about Gallagher's. All I know is that when I moved into the house that I'm in, in 1993, it was there. So that's, like forever. I learned a few things about the place while I was there to today, and I'll share what I know, but it's not much. First of all, it's a Sports Bar. I'm not a big sports fan, but apparently a lot of people are, and that's where they go to watch the Big Game. The place is divided in half, and the half I like is the restaurant half. They have nice big tables, and when I go there it's nice and quiet, with music from the '80s, and I can hold conversations with my friends. The other half is more lively, and there's not just a bar there, but (and this is what I just learned) it's part of Turf Paradise. So you can watch the Big Game, and bet on the horses. And there are other things there that you can bet on, like Greyhounds, and stuff like that. I'm not a gambling man, so I don't know. My plan is actually go to the other part of Gallagher's someday and gamble a dollar. The manager there said that I could bet a dollar. I have a stack of four gold dollars that have been sitting on my desk next to my computer for years, so I'll put them in my pocket the next I go, and lose them. You can see why I'm not much of a gambler! Gallagher's is one of those places that does the magic trick of looking small on the outside and being bigger inside. If you live in the Sahuaro Ranch neighborhood, you may have driven past it a million times without ever seeing it. I don't remember how I discovered it, I probably just wandered in one day. Most of the places I wander into are a disappointment, and I never go back, but I've been going back to Gallaher's for twenty years. No, they're not paying me to say anything about them, and I'm not an investor there. But it's my favorite place in my neighborhood, and it's part of my community, and my world. So I invest in the place, by eating burgers, and having a beer sometimes. I try to get there as often as possible, and I always ask friends to take me there. My regular table is the one right at the entrance to your left, and if you see someone who can't seem to shut up about Phoenix history, that's me. I love living in this neighborhood, and I hope that I will be here, like forever. I take my dog to the Sahuaro Ranch, I taught at the Community College, I workout at the Fitness Center there. I watched this neighborhood grow around me, and I'm well pleased. I care about the places here, and I show it with my investments - like ordering a cheeseburger, and a beer!